With temperatures in Coventry struggling (and for the most part failing) to get above freezing for a while now, I think we can safely say that Winter has arrived. We've got off fairly lightly compared with most of the country, only seeing a light snowfall; certainly no more than a couple of inches. That said, I think this the first time I've seen snow in November, despite living in Coventry for 12 years now. Christmas is almost upon us and I'm trying not to dwell too much on my impending return to work in January. Maternity leave seems to have just flown by and I can hardly believe that my daughter is six months old. Christmas itself is likely to be a low key event this year; we've foregone the typical tour of the country which normally marks this time of year for us. The current weather aside, it just isn't practical to do flying visits on that kind of scale anymore. Instead we're looking forward to our first Christmas as a family at home together. I haven't had much of an opportunity to update here lately because M is a lot more aware of her surroundings. Little hands seem to need to explore everything and the laptop is particularly exciting. All those buttons and a bright screen are enticing but the fact that Mummy is playing with it make the computer great fun. I on the other hand am proving to be a bit of a meany. I just don't think drool and keyboards mix very well and no amount of excited shrieking has so far persuaded me otherwise. Our difference in opinion regarding computer use is seriously impacting my time online. I can of course use the phone, but it's not the same thing at all. I may be absent from the internet but I have managed to do a tiny amount of crochet. M has a keen eye for yarn and likes to handle (and nom) anything I'm working on - if this continues I foresee my daughter developing an interest in textiles! My usual approach to her assistance is to show M what I am working on and talk to her about it which seems to go down well. 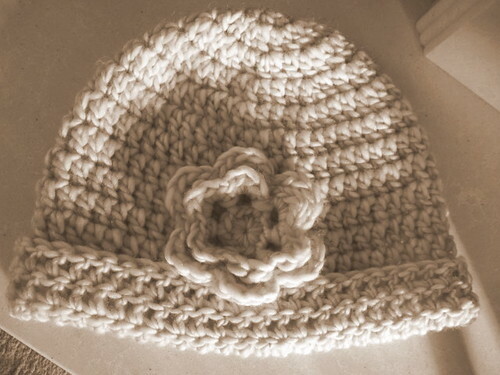 While I hunted down suitable baby yarn I decided to have a go at crocheting a hat... for ME!!! 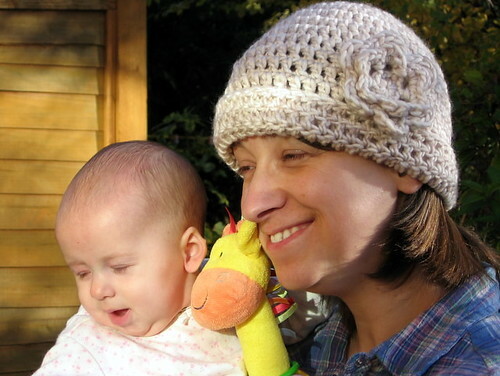 The last time I attempted to crochet a hat for myself it didn't end well but I was willing to give it another go. My life as a non hat person does seem like a bit of a wasted opportunity for endless crafting fun. With limited stash diving and acquisition I opted for the top down or last in first out approach in my yarn choice. I picked up some Sirdar Hug from Mrs T's last spring with a chunky waistcoat in mind. As the nearest thing to hand it became hats. Dave bought me a copy of Melody Griffiths' Crochet in No Time for my birthday which had a pattern for a simple hat called Cloche with Flower (Ravelry Link). All of the designs in this book are intended to be either quick or easily picked up and put down again so seem ideal for working around a small baby. I had a go and the pattern actually worked. For me this was unusual because I always end up having to tweak a pattern before it works. Not in this case though. I worked this hat up exactly as written and got what I was expecting. No fuss. No need to puzzle over the instructions. No experimenting to test the pattern. It just worked. Wow! All i can say is a heartfelt well done to the designer. I tried the hat on and was shocked to discover I liked the result!!! Sirdar Hug is a chunky yarn, 50 percent wool mix spun as a single ply so works like a roving. It has a very soft hand and I suspect would felt fairly easily. 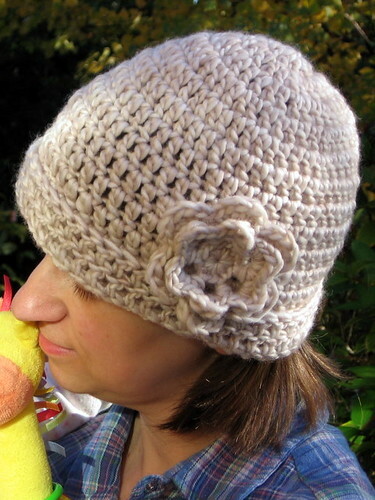 This hat was worked on a 7mm hook to achieve the specified gauge. These photographs were taken in milder weather but having worn the hat in snow I can say it kept my head and ears toasty warm. Excellent stuff. Nice hat and it does suit you.